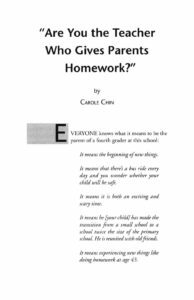 Are You the Teacher Who Gives Parents Homework? Summary: In this chapter from the NWP publication, Cityscapes, an elementary teacher describes how she uses the writing of students and their families to build community, honor family cultures and languages, and provide a forum to address fears, anxieties, and concerns. Threaded through the narrative are many suggestions for activities that teachers might adapt to their own settings and communities. It was in this setting that I decided I wanted to use writing to build a sense of community and to provide a forum for students and parents to express fears, anxieties, and concerns. I wanted to keep track of what happened when parents and children wrote about the same subject. It was my belief that through writing a teacher can include those families who might otherwise feel alienated from the school; it’s a way for parents to stay involved in their children’s education. I was also interested in what effect, if any, the parental writing might have on the children. This was another form of communication for the children, the parents, and the teacher.